A 3D style game inspired by ball-and-paddle games, such as Breakout. 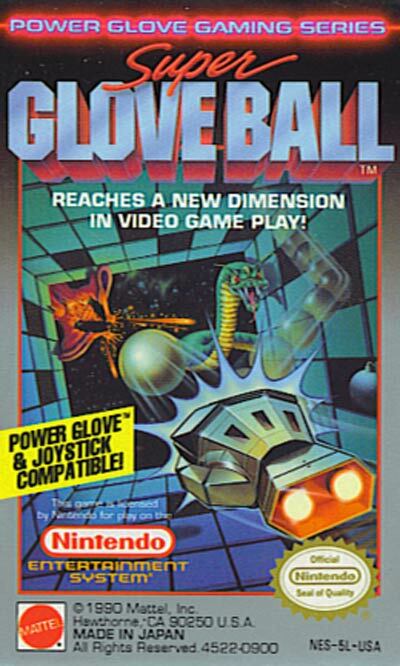 Super Glove Ball was designed exclusively for Mattel's Power Glove accessory. (Although it can still be played with a normal controller) Your shuttle commander has been trapped in a dimensional maze in space, and you must use your glove to throw an energy ball at the walls in order to advance. The walls in each maze room you encounter are filled with blocks. Using your Power Glove, you have to entirely break down a wall before being allowed to advance to the next room. While trying to progress through the maze, your character will be under attack by a range of creature, and a wizard who wants to mess with your work. The object for the player is to find the way out of the maze and rescue the Commander.